Former English professor turned blogger, Jade Blackwell, is enjoying her predictable routine when trouble comes knocking in the form of an old friend and colleague. Unbeknownst to Jade, Gwendolyn Hexby is no longer the successful academic she once knew and trusted—she is now following a new calling as a psychic medium, a contentious career that flies in the face of the logic and deductive reasoning Jade values. At first, Jade welcomes the visit, but things soon turn bizarre as Gwendolyn brings only disorder, danger, and disruption. When a murder is prophesied, and a beloved pillar of the Aspen Falls’ community winds up dead, Gwendolyn becomes Sheriff Ross Lawson’s prime suspect. To get Gwendolyn out of hot water, and more importantly, out of her house, Jade attempts to prove her friend’s innocence. Jade believes she’s finally discovered the truth, but is soon brought back to reality when she learns all is not as it seems in the realm of the metaphysical. Not even murder. 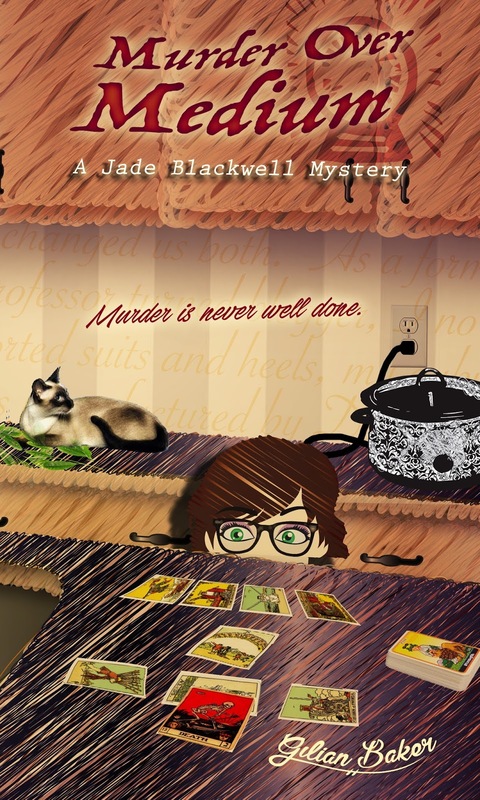 Return to the Jade Blackwell Cozy Mystery Series in Murder Over Medium, as Jade jumps into the fray of a territory not governed by logic or reason—in either this world or the next. Jade Blackwell, the protagonist of the series, left the world of academia to pursue the life of an entrepreneur. Now she teaches writing informally on her successful blog and is CEO of a ghostwriting service. That is, when she’s not busy solving murders. She’s happily married to her high school sweetheart, Christian, and they have a daughter, Penelope, who is away at college. She describes herself as a much younger and better-looking Miss Marple. She loves her auburn bob, though the color is now manufactured by Darlene at the Hair Hut. She hates her newly-required bifocals. She’s a smart, sassy homebody who lives in her head. Jade, how did you first meet Gilian? I knocked around in Gilian’s head, trying to get her attention for years. She always told me she was too busy to come out and play. But I kept after her. She finally gave in when she took her daughter’s advice to join NaNoWriMo in 2015. I’d like to think I saved her. Well, at least her sanity. She was a struggling blogger who spent way too much time working. I gave her a way to enjoy life while still producing something worthwhile. She gave up on blogging and now spends much more time with me. Why do you think that your life has ended up being in a book? Besides my charming personality and wit, I’d say because there aren’t many, if any, other professional bloggers who are also amateur sleuths. The work-at-home way of life has exploded over the last few years, and I believe people are fascinated by what an online entrepreneur does all day. Plus, Gilian and I like to think we provide a fun distraction from the endless to-do lists we all live by in our modern world. Did you have a hard time convincing Gilian to write any particular scenes for you? Well, just one. I took exception with the ending. I wanted to save myself this time, but Gilian didn’t write it that way. Actually, she didn’t even pay attention to my wish until after her editor had it in her hands. I couldn’t convince her to make the change, but we found a compromise. She wrote an alternate ending that she’s giving away to readers, so I guess that’s better than nothing. I’d love to be proven right—that my idea was better. So, it would be awesome if anyone reading this would finish the Murder Over Medium and then get the free download of my preferred ending. Then, email Gilian and let her know which you like better. The link is in the back of the book. Thanks, folks! I’d sleep in for starters, because my husband Christian and I usually get up early. I’d luxuriate in the jacuzzi bath we have in our bathroom and then I’d meet up with my friends Gabby, Crystal, and Phyllis for lunch at Tea & Sympathy. Before we left, I’d buy one of Millie’s famous chocolate fudge nut cakes to enjoy for dessert after supper. I’d go home and curl up on the couch with a good mystery, my cats, Tommy and Tuppence keeping me company. Since I hate to cook, I’d text Christian and have him bring home a pizza from the Pie Hole on his way home. In the evening, we’d enjoy our pizza and chocolate cake while we watched a rerun of Midsomer Murder, one of our favorite British mysteries. We’d have an early night, and I’ll leave the rest to your readers’ imaginations. What’s the best trait Gilian has given you? Besides my natural inquisitiveness, which all good sleuths need, I’d say my best trait is my strong B.S. meter. I became a good judge of character teaching college students for years. Hmm. That’s a tough one. I’d have to go with that double-edged sword, my curiosity. I personally don’t mind it too much, but it has been known to get me into perilous situations from time to time. And it drives my husband crazy. Doubting herself, and me, for that matter. She needs to just listen to me and her instincts more during that challenging first draft. She worries too much. But as I tell her, it always comes together in the end. I’m bored with my work and am currently trying to find just the right new challenge for my online business structure. There’s a lot of things I could do, but none I’ve found so far curl my toes. When I was an English professor, there was always something new to research. Always a new semester with different students to engage. But after four years of entrepreneurship, I find myself in need of tackling something new. Gilian and I are working on a solution, and readers will be able to see what we come up with in the next book. You know, I get asked this a lot. It’s a difficult one to answer, but I recently decided on an older Honeysuckle Weeks. She’d need to perfect an American accent, but I trust she could do that. She’s a talented actress who could get across my smart, saucy, yet loveable, personality. Describe the town where you live. Oh, Aspen Falls, Wyoming is a gorgeous place. It’s in the southeastern part of the state, about an hour from Laramie, where the University of Wyoming is. Aspen Falls is a small village filled mostly with people who, like me, were born and raised there. We get some tourists coming through on their way to other places, but mostly we are ranchers. We have a small market, a pizza place, a nicer Italian restaurant on the edge of town, and, of course, my favorite little tea shop, Tea & Sympathy. We are home to the county sheriff’s station where my friend Ross Lawson is sheriff. There’s also a non-denomination church, as well as the Gee and Tee bar. Aspen Falls is in the foothills of the Bow Medicine Mountains and is a magical place to live or visit. What makes you stand out from any other characters in the cozy msytery genre? I already mentioned my occupation is unique to the genre. Besides that, I’m happily married and have a daughter. Most cozy protagonists have a tangled, messy love life they are trying to figure out. With me, readers get a chance of pace—they see a woman in a stable relationship and all the ups and downs that entails. And, well, motherhood brings its own complications into the stories. If you could be “adopted” by another writer, who would you choose? The biggest honor I can image is to be adopted by Sue Grafton. It was such a loss for the world when she passed. She’s been my favorite authors for 30 years. Although her books aren’t firmly in the cozy mystery genre, I know she’d do a dazzling job of bringing my adventures to life. Gilian Baker is a former English professor who has gone on to forge a life outside of academia by adding blogger, ghostwriter and cozy mystery author to her C.V. She currently uses her geeky superpowers only for good to entertain murder mystery readers the world over. When she’s not plotting murder for her Jade Blackwell cozy mystery series, you can find her puttering in her vegetable garden, knitting in front of the fire, snuggling with her husband watching British TV or discussing literary theory with her daughter. Gilian lives in Flagstaff, Arizona with her family and their three pampered felines. In her next life, she fervently hopes to come back as a cat, though she understands that would be going down the karmic ladder.